The first indication of Nick’s graciousness appeared early in the show on Oct. 25. As he is wont to do, the man often bent down from stage to shake hands with fans in the front row. At times, it was as if he were conducting the outreached hands of the audience in a symphony of mutual appreciation. After performing “Jesus Alone,” the opening number taken from Skeleton Tree, the 16th studio album by the Australian rockers, he interacted with some admirers at stage right who handed him some food! Bemused but composed, Nick Cave demurred, handing the dish to a stagehand. The moment and the delivery were really quite humorous, and the dapper singer continued stoically into the set to perform “Magneto.” Those first two songs hailed from Skeleton Tree, the most recent album (released in 2016) by Bad Seed Ltd. This show, the Skeleton Tree Tour, didn’t overtly concern itself with the new album, although it did lead the set list with four selections from the NC&TBS catalog. Nick Cave & The Bad Seeds truly hit their stride with the cautionary tale of “Red Right Hand,” a 1994 gothic strike of a song. Nick’s delivery was clear and vivid, and the pace of the song became more frenzied, inspiring Nick and the Seeds to whip themselves around the stage. A lesser performer may have seemed merely quirky in a stormy rendition of the ominous number, but Nick was rather imposing and delightfully enjoyable to watch. The best extended segment of the show began after the midpoint with “The Ship Song” and “Into My Arms,” performed with such dramatic relish as to justify the band’s largely dull interest in religious themes. 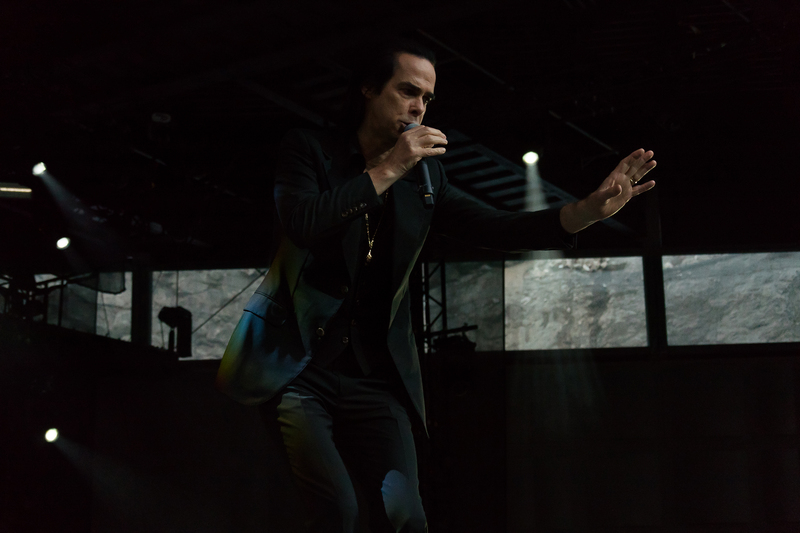 With Nick Cave, the show is the thing, however, and the frontman was very open, very expressive, and very savvy with a move into the audience and eventually onto an island stage set next to a film camera in the middle of The Anthem. Nick’s congeniality and accessibility continued through the end of the set as he invited dozens of people to join him upon his return to the stage as he swaggered through “Stagger Lee,” The Bad Seeds’ 1996 take on a 1911 folk murder ballad. Nick Cave has concluded his current US tour. Put him on the books for next time! Even if you’re not necessarily a fan of the music, Nick Cave’s live performance will win you over. Nice write-up! About the encore though: another audience member requested some song, to which Cave replied that they had retired it 30 years ago. The Mercy Seat was indeed also requested, but they didn’t mention anything about retirement in relation to this particular track.